We’ll help you sift through your research, answer your questions and encourage you to get out for test rides. While it can take several trips to settle on a specific model, once you do, our large pre-built inventory makes it likely your model/color will be available to take home that very day. Generally, “stock-built” trikes (including simple options like fenders, lights, racks) ordered by 2 pm are available by close-of-business (on busy days, priority goes to customers visiting us from more than 50 miles away). More involved options such as pedal-assist motors, Rohloff hubs or Shimano electronic shifting (RPDX Speedshop, Adaptive and Electric) generally take at least overnight, but we’ll always work hard to meet your needs. While we’re readying your recumbent, you can step out for coffee, we can recommend fantastic SE Portland restaurants (or you can relax at the kitchen table with Lilly and Rosie who never tire of attention). 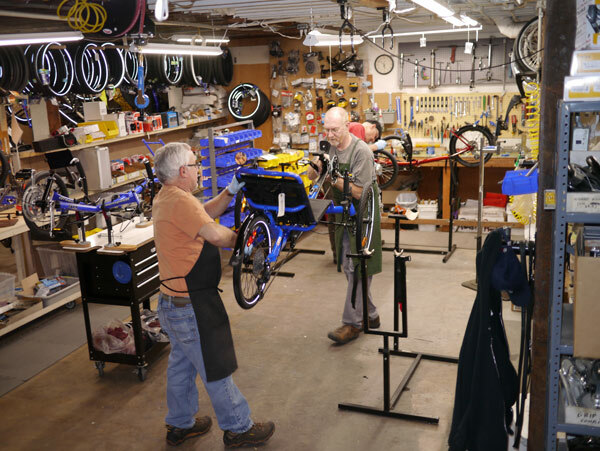 Before you leave with your trike, we’ll instruct you on basic care: lubricating the drive chain, cleaning the components and -if you’ve bought a folding recumbent – help you practice folding. We’re happy to load your trike into your vehicle. If you’ve bought a car hitch rack from us, we’ll install that too (you can always call in advance to discuss what fits in your particular vehicle). We accept Visa, MasterCard, cash and checks (bikes/trikes released after check clears).